Wasgij Original 27: The 20th Party Parade! is the incredibly funny, special edition 1,000 piece jigsaw puzzle that marks the 20th Anniversary of Wasgij! 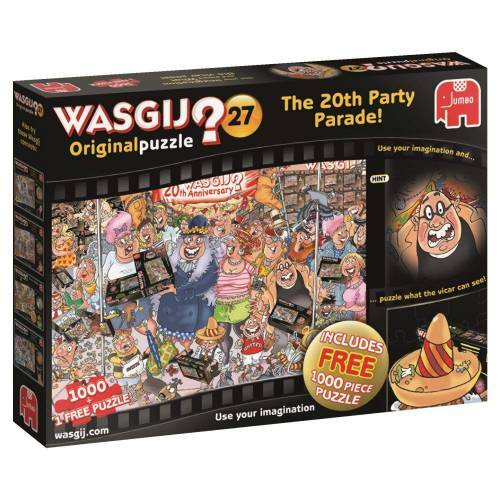 The image printed on the front of the box depicts crowds of familiar-faced fans who have all rushed out to buy the special edition Wasgij jigsaw puzzle! While everyone scrambles to grab their favourite Wasgij puzzles and the store prepares for the 20th Anniversary celebrations, something has caught there eye outside of the store. Who or what could be outside of the shop to make so many Wasgij fans so delighted? Try to imagine you are the Vicar in the black top and piece together what he can see. Also once you have finished puzzling together the fantastic 1,000 piece Wasgij solution puzzle, you can then puzzle together the FREE 1,000 piece box image puzzle! But that is not all! With this Wasgij you can win a Limited Edition Wasgij Puzzle! To enter and for full T&Cs, see in pack Wasgij Original is the unique brainteaser puzzle concept where you have to work out the cause of the scene in the puzzle box image and discover why the characters in the illustration are looking so shocked? Can you use the clues to determine what has happened? Use your imagination and puzzle what everyone is looking so shocked about. Remember, only the puzzle holds the answer! This fabulous Wasgij puzzle has been illustrated by Jumbo’s popular artist – James Alexander – and James’ hilarious sense of humour shines through each of his Wasgij puzzles, and is part of why the Wasgij brand has a massive fans base across the world. The completed jigsaw puzzles measures 68x 49 cm when completed and has been produced on a high quality cardboard using Jumbo’s precision die cutting techniques to ensure you receive only the highest quality of product and so that each jigsaw piece maintains its original shape for as long as possible.